India’s energy storage sector is at an interesting phase. Energy storage has almost 20 different applications in India such as renewable integration, grid ancillary services, diesel minimization, microgrids for energy access and campuses as well as electric vehicles and charging infrastructure. Indian energy storage market is growing but still, there is a supply-demand gap. IESA estimates the market for energy storage would grow to over 300 GWh during 2018-25. India is expected to attract investment in 2-4 Giga factories for advanced Li-ion batteries, attracting over $3Billion in investments in next 3 years. Already, over 1 GWh of annual assembling capacity is being set up for converting imported Li-ion cells into battery modules by various Indian companies. Opportunities include manufacturing, assembling, energy storage project development, equipment supply, R&D of technology enhancement and much more. This extensive market has intrigued many foreign technology players as well as Indian companies to explore the sector. The Government is also creating encouraging policies like FAME India Initiative under NEMMP, draft energy storage Roadmap, National Smart Grid Mission (NSGM) and draft National Microgrid policy, Energy Storage staff paper by CERC, BIS Energy Storage Standards to boost the Indian energy storage market. Various states like Maharashtra, Karnataka, Andhra Pradesh, Telangana, Uttar Pradesh, Gujarat, and Rajasthan are also taken the first step toward EV and energy storage policy creation to boost the market. Currently, MNRE is also creating National Energy Storage Mission (NESM) to catalyze the adoption of manufacturing in India. IESA is also part of various state and central government taskforce, expert group, and standing committee. IESA is continuously providing its inputs and suggestions to various government institutions by gathering feedback/ suggestions from its members and industry stakeholders. On 23rd September 2017, IESA organized 1st India Energy Storage Policy Forum to celebrate World Energy storage Day. It was attended by 50+ Policymakers, regulators and tender authorities with 100+ Industry stalwarts. In this policy forum, key government bodies that are working on regulations that affect energy storage, microgrids and electric vehicles will be part of the roundtable. Last year’s forum saw active participation from government organization like NITI Aaayog, MNRE, MoP, CEA, CERC, PGCIL, Skill Council, Invest India, POSOCO, and tender authorities like SECI, NTPC, BHEL, EESL, NLC, REIL and other bodies like Brookings India, ICAT, SIAM and many others. 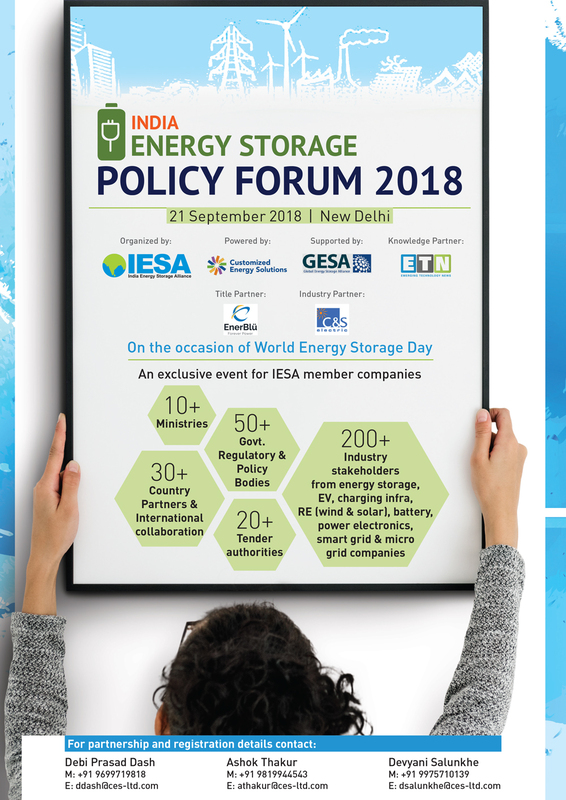 This year’s 2nd India Energy Storage Policy Forum (IESPF- 2018) is planned on 21st September 2018 at Delhi. The objective of this forum is to have a dialogue between thought leaders from industry and the policymakers to identify policy priorities that can help drive adoption of energy storage, Microgrid, and Electric Vehicle technologies in India and make India a global hub for manufacturing of advanced energy storage technologies by 2020. We expect 10+ central government ministries, 50+ government regulators & policy makers, 20+ state government authorities (EV, Renewable and Electricity Grid) and 20+ tender authorities to be part of this forum. As a new initiative, this year we are also inviting 20+ country embassies, trade agency, and council to join the event with 10+ International and national organizations like ISA, IRENA, IEA and many others. This will enhance India’s role to be a global leader in energy storage, EV, and microgrids. We also anticipate 200+ industries to be part of this forum.